The RSS view of your post has a graph and conclusion but the page view is cut short. I think it is non-linear because the head is offsetting by the desired width each time but the filament is actually growing faster. So each shell gets printed with the nozzle closer to the previous one. That helps force the plastic in that direction and reduces the void. In fact I concluded some time ago that the nozzle should only be placed in the centre of the filament path when it is doing the outer shell. For paths where it is bounded on one side only it would be better placed as close as it can be to that side without blocking the orifice. That gives the smallest voids and the strongest object. What nozzle size and extrusion width are you using? I have a hypothesis that setting the extrusion width to nozzle diameter + layer height or higher (in conjunction with careful e_steps calibration) will mitigate this effect, at least to some degree. 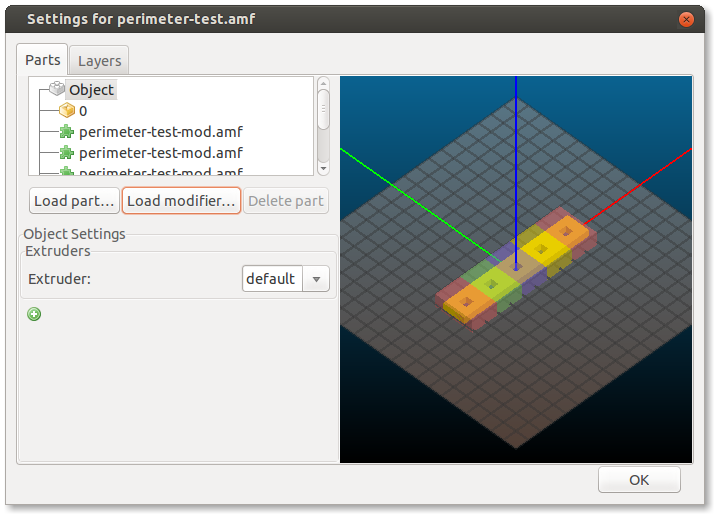 This also seems to help with overhangs, which are the big reason for not printing outer perimeters first. I’d be interested to see the results of the same test with a greater extrusion width. It would be interesting to test with the extrusion width set higher, adding layer height so that you can (in theory) get the entire “racetrack” shape with each pass, rather than just the first one. I suspect that this will actually result in better squeezing of the plastic into the space around left by the previous pass. Also, of course, the increased width/thickness ratio is beneficial, not just for decreasing voids as nophead says, but it’s also good for overhangs and (at least worst-case) inter-layer contact area. Printing this way also seems to yield better optical properties when printing with translucent filaments. Basically the bigger the width to height ratio of the filament the smaller the voids due to the rounded edges are, so the less the error is. Also with less viscous plastic, e.g. PLA printed at higher temperatures, the less the error is. Would it be stronger to keep the extrusion width the same and shrink the exterior perimeters to compensate for the error.